With just a small stand on the patio of Lawrence’s great dive bar the Replay Lounge, Taco Zone had perhaps an inauspicious beginning. Yet its humble origins don’t really tell the story of its serious cooking, or its growing ambitions. This small taco stand-turned-downtown Lawrence fixture has a talented, experienced chef with French training, an expanding catering operation and even a brand-new hot sauce to offer. Taco Zone is the brainchild of three partners: brother and sister Brad and Courtney Shanks, and Courtney’s husband, chef Brian Ayers. The three all originally hail from Lawrence, though all left town in the late ‘90s and early ‘00s to pursue different artistic and entrepreneurial opportunities. The Shanks settled in Brooklyn, opened a vintage clothing store and started a successful indie rock band, Blood on the Wall. Ayers, whose first kitchen job was at a restaurant in Lawrence, attended culinary school at Le Cordon Bleu in Paris, then proceeded to work in celebrated kitchens in France (including at a three-star Michelin restaurant), New York and Melbourne, Australia. Eventually, Brad landed back in Lawrence, while Courtney and Ayers settled in Los Angeles, where they reconnected and eventually married. About five years ago, Ayers and Courtney Shanks looked to return to Lawrence. Ayers asked his brother-in-law what type of cuisine or restaurant was missing in Lawrence, and Brad immediately responded: a taqueria. Ayers, being in Los Angeles and thus surrounded by hundreds of taquerias, began doing research with Courtney and Brad, and felt like he could expand on the taqueria idea to add something of his own to the venture. Taco Zone recently began selling its hot sauce. Ayers and Brad contacted a friend of theirs, Nick Carroll, who owns the Replay Lounge, and asked if they could operate a small taco stand on its large patio a few nights per week. Carroll liked the idea, seeing a mutual benefit. The small stand turned out to be so popular that Ayers and the Shanks felt they had a winning idea for their own separate small business. After more research and meeting with potential investors, they found a 900-square-foot space on East Eighth Street, just off of Lawrence’s main strip, Massachusetts Street. They ultimately decided to start the business on their own. Taco Zone now serves a rotating menu of about 20 different proteins, including cochinita pibil (slow-roasted pork in an annatto-based sauce), smoked chile chicken, lengua (pork tongue) with roasted peppers and onions, carnitas, lamb with olives, chicken mole poblano, steak or tempeh picada (a sauce with history in Spain), white bean calabacitas (a sautéed squash recipe) and many more. Those proteins can be made into tacos, a burrito, torta (sandwich) or nachos. Salads are also available, including vegan options (vegan/vegetarian options are also always available for the other dishes, including the calabacitas and black bean varieties). Ayers cooks the food for Taco Zone from scratch at an off-site kitchen each day – Taco Zone does not have hood vents and thus cannot have fryers or ovens in its storefront – but this is ideal for Ayers’ slow-cooked cuisine, which is brought downtown before opening and is ready-to-serve on site. His flavors are influenced from his time in Europe, as well as the flavors of California and Central America. The partners have recently been expanding their operations to include catering. Brad notes with some surprise that their wedding business has really taken off in the past year, and they are already nearly booked up for the month of October. He notes, with a laugh, that there is a little bit of a generational divide when it comes to people ordering a taco bar for their special events. Some parents, especially fathers, he says, think of a taco bar as being kind of like cafeteria food. He says he has been happy to see their minds change once they see the spreads Taco Zone offers: several types of meat and protein, cheeses, sauces, pickles, salsas and more. Brad originally learned plating from his partner Ayers but now says he’s made so many tacos that he has developed a sense of how flavors and colors should be combined for a beautiful presentation. 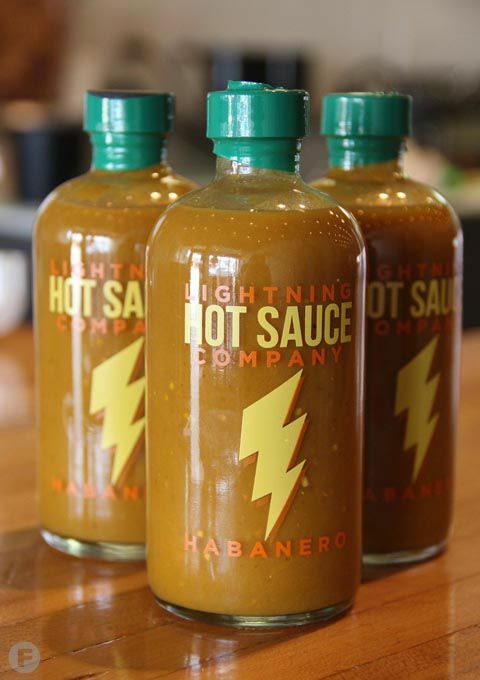 The most recent development for Taco Zone has been the release of its new hot sauce, bottled under the name Lightning Hot Sauce Co. Ayers and the Shanks recently completed work with the Kansas State University food lab on the product to determine proper nutrition labeling for their first offering, a tangy West Indies-style habanero sauce flavored with lime and mango. It does have some heat from the habanero, but is bright with citrus and slightly sweet, though has no added sugars. The sauce is available at Taco Zone, and hopefully will be available in grocery stores soon, according to Ayers. Taco Zone has been open for just a couple of years, but has proven it’s a little taqueria that increasingly offers so much more than just your average tacos. In our second installment of 10 Questions, Taco Zone co-owner, general manager and one-time rocker Brad Shanks (formerly of the indie outfit Blood On The Wall) chats about life after Replay Lounge, the surprising popularity of the tongue taco, and brotherly (in-law) love. Each month, we're asking 10 questions to a different chef, restaurateur or Lawrence dining personality. In this case, we're willing to give a pass on what counts as "10" and "questions." Taco Zone started out as a food stand at the Replay Lounge, which has a pretty raucous vibe, as anyone who’s been there knows. Do you ever miss that dive-bar atmosphere? I love that place and a lot of my friends work there, and I worked there as a bartender for a long time as well. I do miss being there. It’s a lot of fun — you know, on weekends, there’d be like, 5, 6, 700 people going in through that door, so it was always pretty wild. And it was a really great way for us to get our name out. People would show up to see a show and have some drinks, and then they’d see us in the corner and they’d try some tacos, and they’d keep coming back. So it worked out really well. Is that how you got your start in the service industry, as a bartender at Replay? With totally different ambiances. But bartending is bartending, right? Did you ever have any experiences as a bartender where people would just pour their hearts out to you? A great bartender is a good listener. That didn’t happen that often, but there were people who would come in and want to chat. Usually, pretty interesting people (tell) interesting stories. I was always there to listen. That was our inspiration for Taco Zone — Southern California-style taquerias. My brother-in-law (chef and co-owner Brian Ayers) and my sister (Courtney Shanks), who’s also a partner in Taco Zone, actually have this really great story. They reconnected in Los Angeles and started dating again after dating years and years ago. They ended up moving in together and getting married, and I’d go out to visit them all the time. They’d take me to these amazing taquerias all around Southern California. It was my favorite thing to do. So, when they decided to move back to the area, Courtney was asking what Lawrence needed or didn’t have, and I was like, “One of those Southern California-style taquerias would be amazing. We don’t have one of those.” This is our version of it, basically. Compared to what people around here might be used to as far as Mexican restaurants in the Midwest, some of your menu is kind of exotic — your oxtail posole, I know, has done really well. Do you think people’s tastes are evolving? Don’t worry about it. Could you explain guisado for people who don’t know? Yeah, it’s tongue. It’s not your typical thing you’d find on just any menu. But the guisado style of just slowly cooking it and introducing these roasted pepper and onions really adds this heightened flavor to it that’s a little spicy and something you might not have experienced before. And people are fans of the lengua? It’s been amazing. We’re calling ourselves a taqueria, we are a taqueria, and we’re realizing, “OK, you can’t really say you’re a taqueria unless you have lengua on the menu.” We started off just getting people to try it, but I swear, from the moment we started serving the lengua to where it is now, it’s just jumped so far. People are ordering it more and more. 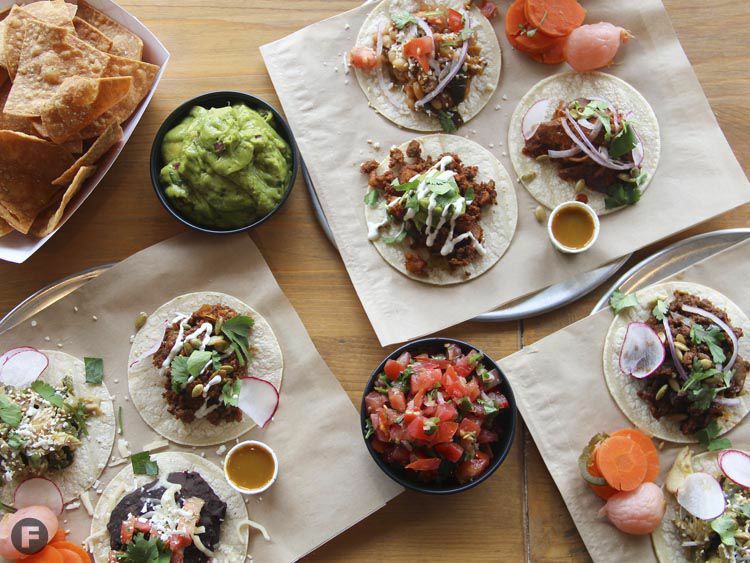 And since we give you an option of three tacos, you can always pick three kinds. A lot of people have just been saying, “Oh, I’ll try the lengua,” and the next thing you know, they’re ordering three lengua tacos, you know? Because it is really, really tasty. Your restaurant isn’t the only one around Lawrence to have made the transition from pop-up to brick-and-mortar in recent years. Was it about this concept of temporary dining options — pop-ups and trucks and the like — that’s become so huge lately? Gosh, it’s hard to say. With food trucks, you have more of a freedom and opportunity to try things out. Same thing with small spots like this — having our stand on the Replay patio was kind of like, “Well, we only have enough room to make four tacos. Let’s make the best four tacos we can make.” You’re constantly trying to switch things up and challenge people with your food and see if anybody likes it, really. And in our case at the stand, we had such great feedback and great response that we felt really comfortable making this jump to opening our first brick-and-mortar spot. When you’re not at the restaurant, where do you like to eat? I really love Leeway Franks. They’re similar to us in that they’re a small little spot trying to do their thing. Their food is incredible. When I was at 715, I used to say, “It’s so nice to work at a restaurant where you want to come and eat or stay for a while after you get off work.” I love that place. I love the Burger Stand a lot. I think what they’re doing over there is just perfect. It’s exactly where I want to go to watch a game and eat a burger. I love Hank Charcuterie, I love 1900 Barker, and Alchemy Coffee’s really cool as well. I love their breakfast sandwiches there in the morning on the weekends…so good. Little Saigon Café out on 23rd Street — I love that spot as well. I could go on and on. Which is nice, because I think about being in Lawrence while I was in school, which was, oh gosh, 20 years ago, and our options were like, (now-defunct downtown bar) G. Willikers. There were very few spots. There was Free State, and that was it. You mean as far as fine-dining options go? Yeah, basically. I love that place, too. Their beers are incredible. I could go on and on. Note: Not wanting to leave anyone out, Shanks later added via email that he enjoys the coconut donuts at Ladybird Diner. Taco Zone, a pop-up taco shop at Lawrence’s Replay Lounge, soon will have a permanent spot in the Kansas college town. Brad Shanks and brother-in-law Brian Ayers launched Taco Zone a year ago. The weekends-only stand serves tacos stuffed with slow-braised meats prepared by Ayers, a classically trained chef. Fillings rotate weekly, but favorites include green chile chicken, chorizo and potato, grilled corn and black bean and cochinita pibil — slow-roasted pork shoulder wrapped in banana leaves. Taco Zone started as an experiment. Now the business duo is preparing to open a permanent shop at 13 E. 8th St.
Shanks says the new Taco Zone will be “a glorified taco stand” where customers will order and pick up food at the counter. The expanded menu will feature made-from-scratch aguas frescas, burritos, tortas, quesadillas, and chips and guacamole. “It’s not a bar, but we will carry a very small selection of beers and a margarita,” Shanks says. The roughly 1,000-square-foot space is still under construction. Shanks and Ayers are targeting mid-April for an opening date. Shanks is still finalizing Taco Zone’s hours, but he says the shop will be open for lunch and dinner every day except for Monday, when it’ll be closed. Taco Zone will likely stay open until 2 a.m. on Friday and Saturday — so it could become a late-night dining destination for bar hoppers. Don’t worry, Replay regulars: Taco Zone’s pop-up taqueria will still be posted at the bar on weekends. The stand is open on Friday and Saturday evenings and will expand to Sundays in April. Eons ago when I was in college, taco night meant 33 cent tacos at the Taco Tico. You would put $10 on the counter, your belt on the table, and settle in for a couple of hours of gastronomical delight. But that doesn’t appear to be the college taco scene anymore, and we all may get to check it out for ourselves soon enough. The Taco Zone, a business that got its start serving upscale late-night tacos in Lawrence bars, has inked a deal to open a downtown restaurant of its own. Documents filed at City Hall show that the Taco Zone has filed plans to remodel a vacant storefront at 13 E. Eighth St. to accommodate a new restaurant. The location is a couple doors down from the Sandbar and is in what used to be an e-cigarette shop. Shanks said he expects the restaurant to open in early spring, but was shy about sharing other details for the business’ plans at the moment. Taco Zone got started by serving tacos on the patio of the Replay Lounge in downtown Lawrence. Shanks said the plan is for the Taco Zone to continue serving at the Replay, but the Eighth Street restaurant will broaden its market. It looks like the Taco Zone has a menu that changes frequently, but it definitely isn’t Taco Tico fare. (Which is probably good because about $8 into a night at Taco Tico you would begin to remember what put the “ico” in Tico.) The Taco Zone’s Facebook page lists dishes such as Salsa Verde Braised Pork, Chicken Tinga, Chili Rojo Beef and Sweet Potato, and a Chicken and Chorizo taco. "Take it from Lawrence locals: The best nights out on Mass Street begin and end with great grub." "The first rule of Taco Zone is that you don’t talk about Taco Zone. 'A lot of people say, ‘We love your food, but we don’t tell anybody about it because we don’t want the secret to get out,'says Brad Shanks, who co-owns Taco Zone with his brother-in-law Brian Ayers. The pop-up taqueria serves authentic Mexican tacos filled with slow-braised meats prepared by Ayers, a classically trained chef who recently moved to Lawrence from Los Angeles. Taco selections vary by the week, but there’s always a beef, pork, chicken and vegetarian option. Taco Zone’s recent recipes have included green chile chicken, chorizo and potato, grilled corn and black bean, and cochinita pibil, slow-roasted pork shoulder wrapped in banana leaves. 'That one’s a big hit,' Shanks says of the cochinita pibil, which is served on a warm corn tortilla with pickled red onions and cilantro.'" "Al pastor, chicken tinga, calabacitas, cochinita pibil -- suddenly the Replay patio is so... global. Maybe a food stand on the Replay patio won't stick around another 20 years. But wouldn't it be cool if it did?"